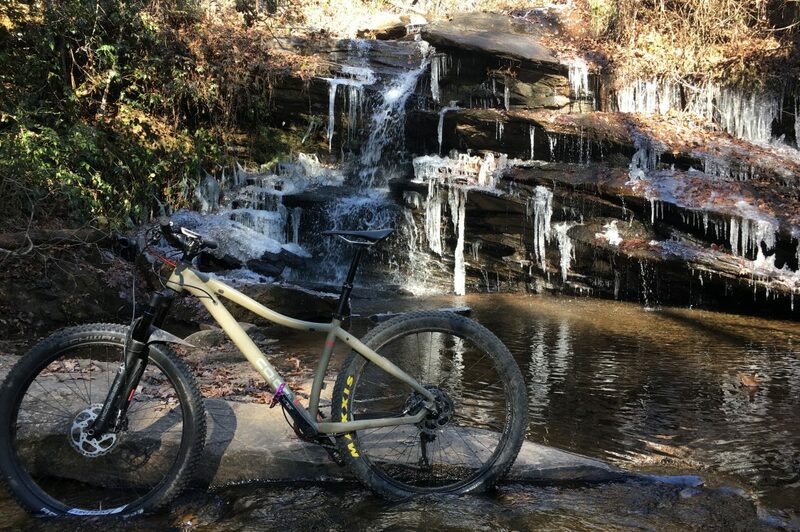 For the past 16 weeks, every moment spent on the bike or exercising has been for the intent purpose of preparing to win the Marathon Mountain Bike Nationals, to be held practically in my back yard, just 2 hours away from me, near Augusta, GA. I came in second place in this event two years in a row in 2013 and 2014 when it was held in Sun Valley, ID. Although I had no idea what the east coast competition would be like, I was confident that I had a fighting chance to earn the Stars & Stripes jersey this time around. An unusually mild May made for extremely pleasant training weather. But what it didn’t prepare me for was the sudden spike to 93 degree temps and an equal degree of humidity on race day. It was only a week ago that the weather took a sudden turn, so I didn’t have the chance to really see how my body would respond during a 60 mile race in these conditions. From my past mountaineering experience at high altitudes, I know that our body’s ability to acclimate is largely a matter of our physiology. But our state of mind also impacts our ability to tolerate significant environmental changes too. I was hopeful that mental fortitude would help me face the South’s excessive heat and humidity. The first 30 miles of the course is fast and flowing. Although I couldn’t stay with the lead group right off the start, my plan was to use this time to keep a strong, steady pace, find a rhythm in the heat and humidity, and then look to push hard on the second half of the course and close the gap. But when I sucked my 50oz Camelbak dry before even reaching the first aid station at the 20 mile mark and less than 1 1/2 hours in, I started to worry. Constantly sipping on that icy cold water gave such relief. It cooled my entire body, allowing me to focus better on the trail ahead and keep pace. I was regimented in taking Endurolytes every 45 minutes, a higher dosage then I take otherwise, to account for the higher temps. In that heat, I certainly didn’t feel good, but I was enduring it and avoiding any cramping or stomach issues. I refilled at aid station 2 at 30 miles. And then again at aid station 3 at 41 miles. And then once again at the last aid station at 52. I was really suffering at the 3 hour mark, the urge to quit slowed my cadence to a pathetic crawl. I could turn around now…end this misery. But I pushed on. It took a full 30 minutes before the discomfort in my hands, back, and ego eased, and I resumed a more reasonable pace. By now I knew I was not even close to contention for a win. It was just a matter of surviving the damn race. At the last aid station, about 7 miles from the finish, I took on some cold blue Poweraid too, a welcome change for the final stretch. It was mostly double track to the finish, with a series of punchy hills to sap you of any remaining humanity. But I actually felt pretty good charging up them. After crossing the finish line at 6 hours 15 minutes (off my goal by 30 minutes), I pedaled straight over to the lake, dropped my bike and helmet, and plunged in still wearing my kit and shoes. It was disappointingly tepid, not shockingly cold as I had hoped. But it felt good to wash away some of the dirt, salt, sweat, and fatigue. I downed my recovery drink. I changed clothes. I went over to the podium area sipping a cold coconut water. Then I downed a Sprite to accompany my free unimpressive beef taco. It was hard to walk. My torso was cramping. My hands were cramping. I slowly made my way back to the car and ate some BBQ potato chips dipped in guacamole and drank a Powerade. I blasted the AC, hoping for some relief. The discomfort ebbed just enough for me to start my drive home. But the cramping in my hands wouldn’t subside. My legs felt like they were quivering. I was uncomfortable going the speed limit, and I was focusing on deep yoga breathing just to keep it together. Certainly all this food and drink would strike my blood stream and I’d settle down. But as Greenwood neared, I wasn’t improving, and I knew I couldn’t continue. Siri got me to a hospital in Greenwood. I couldn’t even fathom trying to walk from the parking lot to the doors, so I just pulled into the 15 minute spot right outside the Emergency Room entrance and staggered inside. My heaving sobs and curses expedited the process, and they quickly rolled me to a room, drew blood and had me hooked up to an IV. Even after 30 minutes of the IV, I still didn’t experience much relief, my legs were still quivering and I’d cramp up if I didn’t sit just right. So I agreed to a muscle relaxer. Shoulda taken that the first time they offered; it quieted things down a lot. Once the blood work was back, it turned out that my sodium levels were extremely low and creatinine levels high (signifying impaired kidney function). Holy moly. During the race, I was so worried about sunstroke and dehydration. Given that I had no cramping or stomach issues during the race, I assumed my regimen of icy water and electrolytes were spot on. I never thought hyponatremia would be an issue. I didn’t catch any warning signs. Lesson learned. A huge thanks to Jared who drove down with his friend Chris to get me and my car home. When we left the hospital at 10pm, everything was shuttered but I was hungry. With little worry of consuming too much sodium at this point, I curbed my hunger pangs with a 4 piece chicken nuggets and French fries from Mc D’s. Even in desperate situations like this, that stuff is barely edible. Experiences like this sure do make me wonder if I should throw in the towel and take up leisurely day hiking. I’ve ended up at the hospital after 2 out of 4 Marathon Mountain Bike Nationals races. I don’t know why I do it. Oh, and guess what? I’m already signed up for another 60 mile race on July 31…. I’ll have a more practiced hydration and nutrition plan by then. By the way, I didn’t come in last. I came in 4th out of 5. Proud to have finished!